Top three classes of threats putting at risk large shares of the global GDP in 2019 are Natural Catastrophes, Financial, Economics & Trade and Geopolitics & Security, shows the 2018 Global Risk Index, also emphasizing for the first time of the threats considered are increasing. "The world is becoming riskier," Andrew COBURN, chief scientist at the Center for Risk Studies at Cambridge University, told a London audience at the release of the report for 2019. "Our index is showing a trend over the past five years where an increasingly large amount of the output is being eaten up by these catastrophes." Released by the Cambridge Centre for Risk Studies in partnership with Lloyd's, the 2018 Global Risk Index quantifies the impact of unpredictable shocks on the world's most prominent cities which, together, yield 41% of global GDP. The Index compiles the impacts of 22 types of threats into a single measurement of economic loss called GDP@Risk. 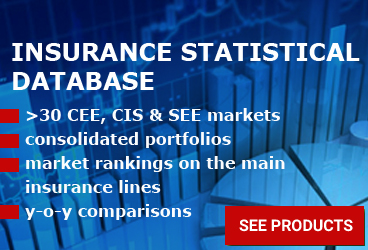 The Index is unique in providing a quantified comparison of risk exposure across 22 different threats and 279 different cities. 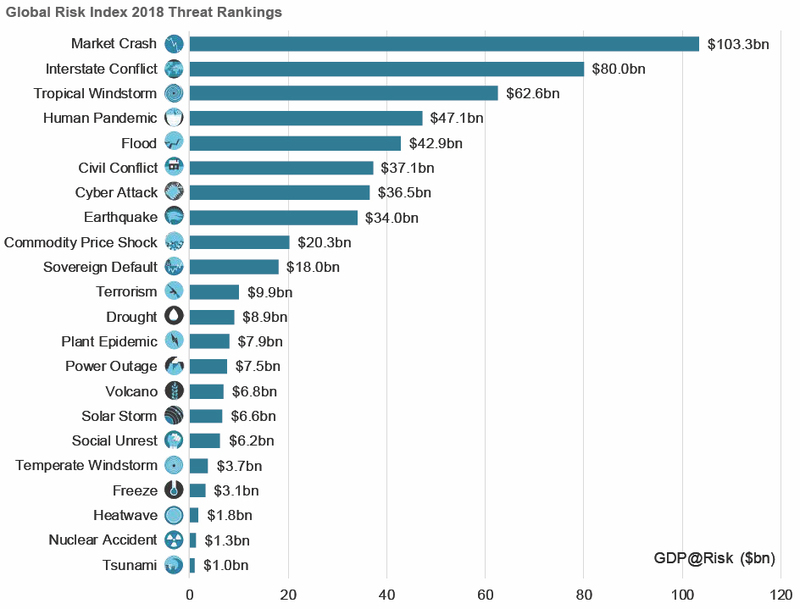 The top three individual threats are Market Crash with GDP@Risk at USD 103 billion, about a fifth of total GDP@Risk; Interstate Conflict at USD 80 billion, 15% of total GDP@Risk; and Tropical Windstorm, USD 63 billion or 11% of total risk. Cyber Attack falls in sixth amongst the threat rankings at USD 37 billion, 7% of total risk GDP@ Risk. As noted in the 2017 Global Risk Index, the capacity for cyber-attacks to cause severe economic damage is on the rise. This is a threat to be closely monitored as the increasing number and severity of attacks is countered by capabilities to protect against them. 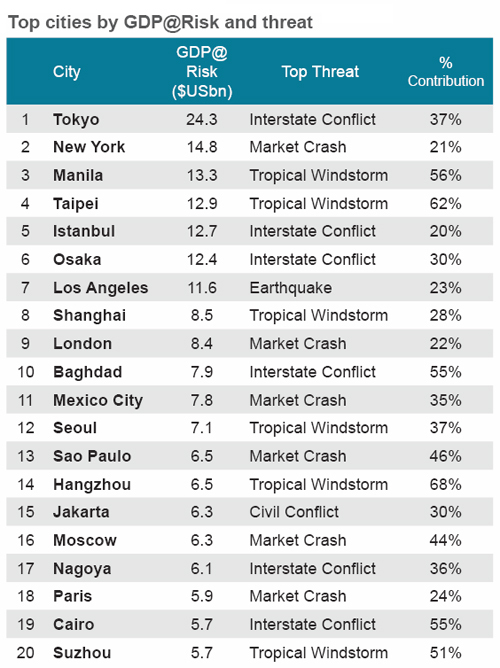 The top 10 cities by risk exposure are Tokyo followed by New York, Manila, Taipei, Istanbul, Osaka, Los Angeles, Shanghai, London, and Baghdad. Their appearance at the top of the risk list of cities indicates two characteristics: a huge annual GDP output, hence the potential, even if unlikely, for large losses; and exposure to particular shocks associated with the geography and type of economy of each city. The resulting GDP@Risk is mediated by each city's ability to protect itself against shocks as well as its resilience in recovering from them. 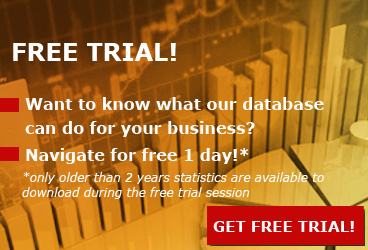 "Shocks to the global economy are largely inevitable, resulting in real losses to the economy. 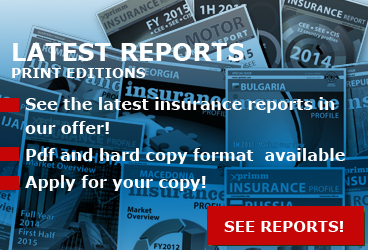 Mitigation of losses is an essential consideration in understanding those losses. In the Global Risk Index, risk mitigation is closely related to the level of resilience of each city, i.e., the time a city needs to recover from a shock. If the resilience of each of the lowest resilient cities, some 45 out of the 279 covered, were improved by just one level then their relative risk exposure would reduce by 11%," the repot shows. 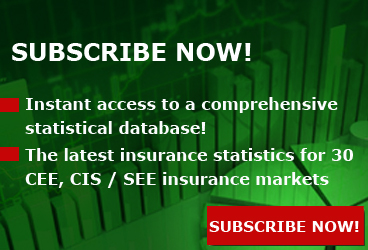 Together with other data, "this is an indication of what the insurance industry calls the "protection gap", and the size of earnings from investment in preparedness and resilience ahead of inevitable yet unpredictable shocks," it adds.